Introducing my new blogger template, Food and Cooking. I love vector illustration so I use it for header and sidebar image. Such a pretty illustration from Dapino. Three columns layout, fresh and green, detailed with fruits, vegtables, and girl vector image, suitable for food and cooking blog. Clearing exams in not a challenging task now as 350-018 is available to you with all those prep products provide you an easy preparation pattern for actual exam. You have to take good grades to make yourself renowned among other students and that is only possible through acquiring best quality ccnp wireless study simulations and dumps. With Pass4Sure, all you can get in the form of 350-001 simulations and online dumps and that is all available to you at affordable cost. One of the most convenient ways you can pass sat preparation latest 350-018 exam materials is through 350-018 Cisco CCIE practice questions and answers online. ged test online exam prep tool really have something that could make you believe in yourself strongly for actual exam success. nice and clean good work!!! I love your work .. its nice & clean ..
can I use the picture with my own personal design .. ? Thank you for this pretty template! Hi! I am using Blog Nero for my tech blog. I just wanna know how I can remove the read the rest of the entry in each post. I want to display the whole article of every post and not just the summary.. Thanks a lot! Hi from Turkiye.This template is very nice.i liket it.i get and i use on my blog.Thank you very much. i love this template - ada yg gambarnya pempek ga? thanks, I used your food lay-out for my recipe site, and I'm very happy w/ my new look, thank you very much! it's really nice n cute! mbaaak... aku donlot ya template yang ini... tengs alot. Salam kenal..
Hi...really like your works here! Can I have a custom made of these kind of template with a mom,hubby,twin boys and a little princess? How much will it cost? Pls let me know.thanks..
Hey great template...Just love it. It's nice and clean. Just used it for my food blog and it looks awesome. Thank you for letting us use it. Keep up the good work. I have a question about editing the html. You have a dotted box on the right sidebar (showing search). I was wondering if I want to remove this box and just have some text there how can I edit the html. I would really appreciate your help in this regard. Thank you! I love it! It's perfect for my blog! Thanks, I really like this one, do you have or know of any others? Nice, i like the green background on the template. Nice collections of food blogs .these are too good. I have used this for my blog, but the comments feature doesn't work on blogger. I have received multiple complaints from readers that they cannot leave comments, from IE and Firefox browsers. Any idea if html code may be buggy and block blogger comment functionality? Hi! I love this template and I really want to use it on my new wife-in-training blog. I was wondering if you can come up with a variation on this. I'm thinking of a cooking/ wife boot camp themed template. You know... a woman in an army/military uniform wearing an apron and instead of a gun, she carries pots/pans/vegetables. The colors you have here are perfect already. I hope you can make this sort of variation. Saya sebenernya pengin hubungi via email atau ym tapi berhubung saya nggak tau...jadi saya minta ijinnya disini ya mbak. aku nyoba pake ini yaahhh..
Fabulous collection of food and cooking blogs! Download this for my blog! Thanks they are looking great! Thank you so much for this template. I love it! Just downloaded this template last night and I love it! I am having a problem though with the search box. I seem to have an extra one on the right hand side that is cut off and it won't let me do anything with it. Any ideas? I am really enjoyed to read such interesting and useful information. My wife has a recipe blog and I think this will do it wonders. Great work, do you have anymore templates to browse through. I am looking for one that has a money theme to it for my blog if anyone has any suggestions. hi ipiet. bagus2 deh templatenya. saya mo tanya kalo uda di donlod n uda di post di blog kita. diatas kan ada kotak tulisan home-comment rss-edit. itu tulisannya bisa diganti dengan tulisan home-product-price list. aku masi newbie di blog hehehe thanks yaa. This is a wonderful Theme. I'm having trouble, it says the Style Sheet is missing. It's not working at all, can you help? 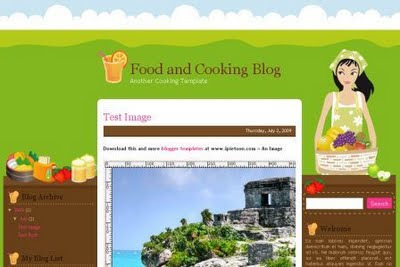 Thanks for sharing this beautiful template for making a food and cooking blog. I like most your post not only you give the very interesting information but also you give the download link as well for that, if applicable. Thanks for sharing, great template! nice template, I like the colors, thanks! td aku coba download templatenya, tp setelah diupload aku kebingungan sama cara posting baru. I like most your post not only you give the very interesting information but also you give the download link as well for that, if applicable. Nice template. Do you have any other template aside from this one? I will try to download this template. I hope I can start my food blog after this. Appreciate all the help. hi! first off, i want to thank you for this very nice template. i'm using it right now...the problem is, i'm having trouble with the sidebar widgets. i've tweaked the template a little bit, mostly changed some of the images to focus more on my niche, and i've been successful so far. the problem is, when i tried to use the widget supplied by twitter for my favorites, the widget title is showing (Twitter Favorites) but the content is not. i'd really appreciate your help as i like the template much. Oh pretty please can you feature some recipes that helps constipation and I would surely follow you for more. Thanks! We specialize in providing innovate and high quality solutions that helps our clients in gaining an edge over their competitors. We ensure that we have a good understanding of the client's expectations, goals and objectives before developing a project. I am really glad to found your post in which you offered interesting information. It is really good read to me. I am really admire the information which you shared here in your blog which is really good read to me. I have seen and read a lot of lot of lot of lot of food/recipe blogs and I have not seen a template like this, it is so nice! food cooking blog may be very helpful all of them mostly are very like it and enjoy in this blog. Food and cooking blog so very nice and more interesting blog because in the post define about the blogger so that can be know that and enjoy it in this blogger. Very impressive post. You have written rally a valuable information. Ijin pake templatenya di blogku ya?? ?